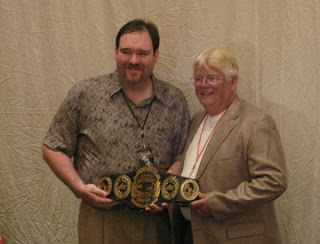 · Jerry Jarrett is the father of multi-time NWA World Heavywieght Champion Jeff Jarrett..
· Jerry Jarrett formed tag teams with his mentor Tojo Yamamoto and Jackie Fargo..
· Jerry Jarrett headed up Mid-Southern Wrestling in Memphis, the CWA, & the USWA for decades upon retiring from active wrestling..
· Jerry Jarrett held ownership of World Class Championship Wrestling and worked in the mid-1990's with the WWF..
· 2002: Jerry Jarrett starts a new promotion to compete with the WWE under the NWA banner, called Total Nonstop Action..
Jerry Jarrett is like a father to me. I am proud to be his friend, associate and step son for many many years. I was very happy to see my friend Jerry at the Monday night Raw event in Nashville in February. It was great to have had the opportunity to visit with him for a good period of time that night. I could go on and on with TRUE stories about our old fraternity/family in the glory days of Memphis Wrestling [which I am very proud of], but those stories have been told and retold umpteen thousand times. So, let me tell you a great story that you never have heard before about Jerry Jarrett. This happened when Jarrett was attending school. This was some type of drafting class or such. He drew out an elaborate schematic diagram for a big sprawling house and he said the intended to build it one day. The teacher gave him a failing grade telling him that it was implausibly designed and impractical to build. Let us flash forward 20 some odd years later and I was invited many times to be a guest in that home on Cumberland Hills Drive in Hendersonville, TN. It is in the proximity to all the country music stars. Jerry also went back [after building his house] – found the teacher and made him change the grade years later after building it. True story! !